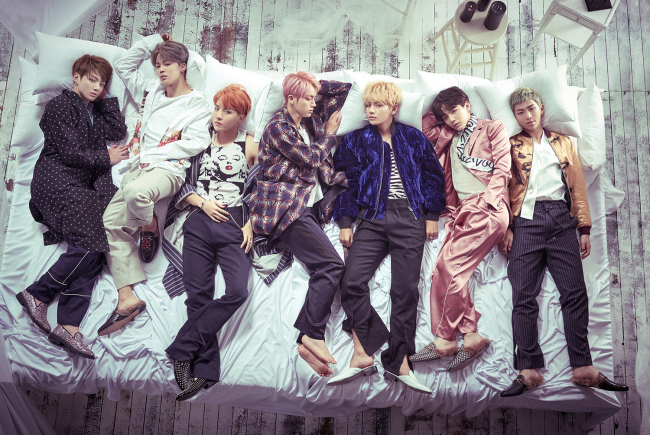 K-pop boy band Bangtan Boys, or BTS, had a strong first day back in the spotlight. Returning with its second full-length album, “Wings,” this week, the group has already topped charts at home and abroad. Released Monday morning, the 15-track album soon dominated eight major local music charts -- MelOn, Mnet, Olleh Music, Soribada, Genie, Bugs, Naver Music and Monkey3 -- according to BTS’ management agency Big Hit Entertainment on Monday. Garnering the attention of international fans, “Wings” also ranked No. 1 on the iTunes charts in 23 countries, including Canada, Brazil, New Zealand, Singapore and Norway, as of Monday morning. Additionally, the album’s title track “Blood Sweat & Tears” topped one of China’s largest music streaming platforms QQ Music. The song’s official music video recorded more than 3 million views in less than 12 hours of its release. The seven-member act is also gearing up for its third global fan meeting “BTS 3rd Muster (ARMY.ZIP+),” which will take place at the Gocheok Sky Dome in Gocheok-dong, Seoul, on Nov. 12 at 5 p.m. and on Nov. 13 at 4 p.m.